As much as I usually love your use of color, Natalie, the stark contrast of b&w is perfect for this. How interesting that the woman & dog are the only creatures making eye contact, with the third figure left out in the shadows. And I find that delightful. I don’t fully understand it either, Teju, and that’s what I like. 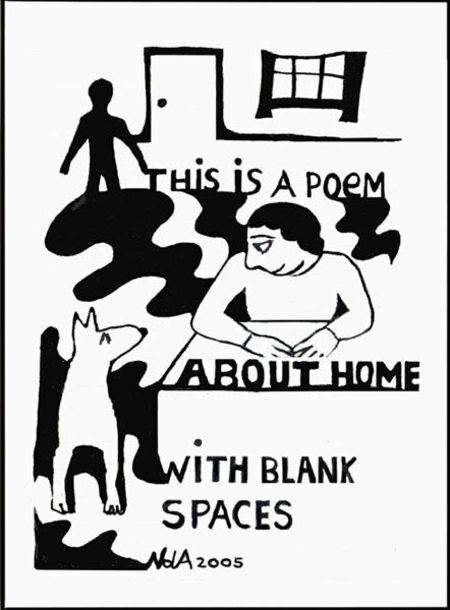 But I do know about the blank spaces in the concept of “home”. beth, how observant, as usual. The window was a second thought, therefore disconnected to the flow of the first thought. Lorianne, the figure in the doorway could be leaving or coming back, whereas woman and dog are most likely staying home. I love the way the wavy shadows are playful or scary, depending on my mood… & the stick man is either comfy-child-friendly or ominously lurking. I love this. Yes, the woman and dog looking at each other, the figure in the back mysterious – coming/going/an absence? Poetry.